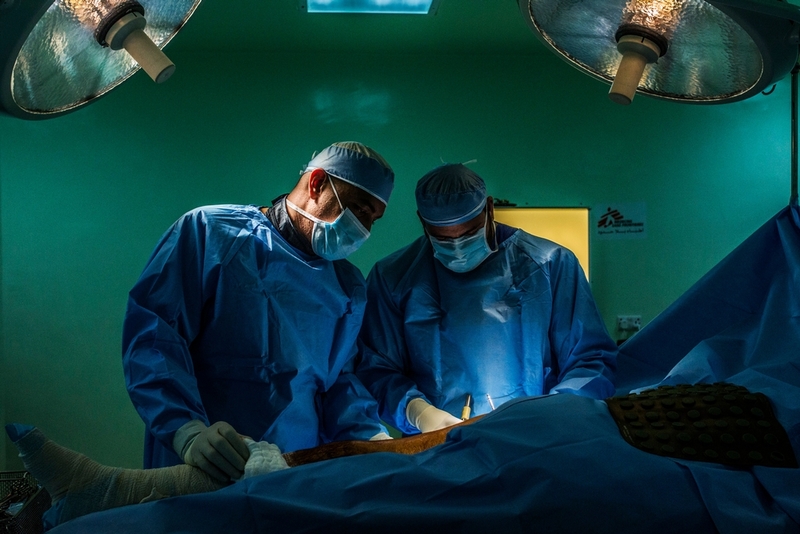 Following several months of scaling up the capacity of a Médicins Sans Frontières (MSF) Hospital for Reconstructive Surgery in Amman, hundreds of complicated war injuries keep on flowing while the waiting list gets longer. This reflects the continuing demand for such specialized care as a direct result of ongoing unrest across the region. In the first half of 2016 alone, 300 wounded arrived from Iraq, Yemen, Syria and Palestine. The hospital continues to provide many specialised surgeries: orthopaedic, plastic and maxillo-facial, and the team is also looking into adding new specialised procedures in the near future. Since 2006, Amman hospital has admitted over 4224 patients and conducted over 9000 surgeries. These numbers reflect only a fraction of the amount of war victims who are suffering due to the persistent consequences of regional turmoil.Cases are identified by a network of Medical Liaison Officers in the patients’ countries of origin. A network of eight Medical Liaison Officers work with the medical team in Amman to identify and refer cases from Iraq, Syria, Yemen and Gaza. The waiting list is getting longer and the cases MSF receive are becoming increasingly more complicated. We receive cases of injuries caused by bombs, explosions, and missiles. For orthopaedic cases for instance, bones are not just broken, but shattered. Burn injuries are extremely severe and can cover much of the body. For face injuries, many cases arrive with half of the face completely blown-off and severe damage to lower and upper jaws. Many patients have lost mobility in parts of their body, while others have lost entire limbs. “They often need advanced reconstructive surgery over a prolonged period of time often many months and even years’’, Ssaid Dr. Hani Sleem, Network Medical Manager. ‘’Building a medical network in non-stabilized contexts is a huge challenge for MSF but it’s a necessity knowing that it’s the only project of its kind in the region providing rehabilitation and reconstructive surgery for war victims for free’’, Dr. Hani continued. The wounds at emotional level are much deeper, most of the patients have been through unimaginable terror and their lives have been changed forever because of disfigurements and the loss of a beloved one. Psycho-social support offered by a specialized MSF team is a crucial part of their recovery. ‘’There is one case that I can still remember quite clearly, a patient who was tortured in prison only a few hours after being wounded. He was deprived of the most basic health care services and was subjected to extreme torture at a time where he was still bleeding. A few days later, his wound got rotten and extremely infected, which led to the need of an amputation surgery later. I cannot forget when he spoke to me with tears in his eyes, he was treated so inhumanely’’, said Dr. Naser Al-Omari, Psycho-social counsellor, Amman Hospital. The reconstructive surgery hospital offers integrated care and sophisticated surgical operations, physiotherapy and psychological support. MSF offers patients comprehensive medical care including physiotherapy,psycho-social support and surgical interventions. Patients are also given accommodation which is available on site in the new location, and financial travel assistance to reach the hospital and return home after or in between treatments if the care plan is staggered over time.